So day two began with me tossing and turning at about 6am. I woke up before my roommate Tim, and tried to tiptoe to the bathroom, but the hotel has the creakiest floors the world has ever seen, and I might as well have been operating a pneumatic drill. Following that I changed the contents of my rucksack about 29 times before making my way to breakfast, which was surprisingly good. We are still the only three (including the other course member Andreas) people staying in the hotel, and no word yet from Kelly apparently. 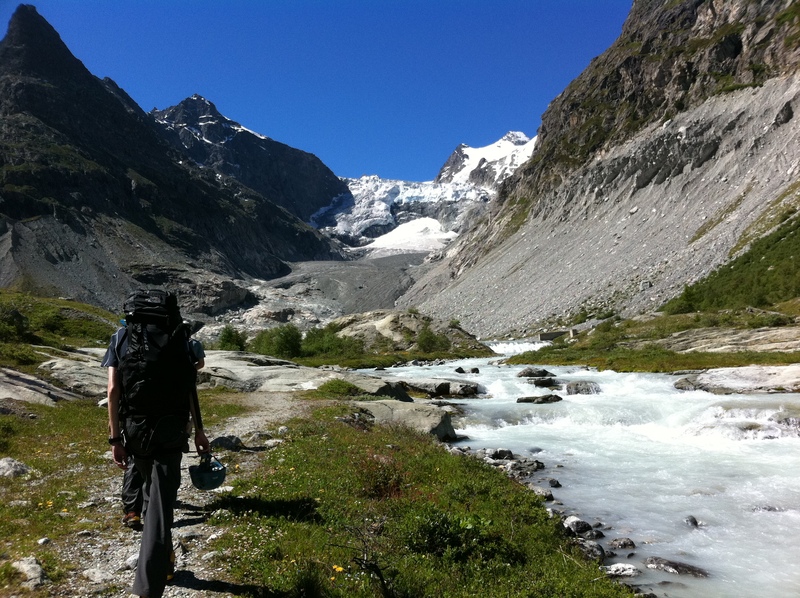 We meet our instructor Andy at about 8.30, and are taken to the boot room to choose ice-axes, helmets, crampon-friendly boots and crampons, and are soon on our way to our the next valley to the west, which will be the site of our glacier training. The car journey takes about half an hour, and it is the most glorious day imaginable, cloudless and windless, and hot, even here at 2,005m. We commence our trek and I am laden down with the heaviest rucksack I think I have ever carried. I have about four hats, a helmet, an ice axe, crampons, two sets of heavy duty waterproofs, fleece, Primaloft jacket, four litres (yes really) of water, a camera that I wish I hadn’t bought, and all manner of suntan lotions, gloves, gaiters, and other stuff that just shouldn’t have been there. I think I even had two torches – why? Anyway, after about half an hour of steep-ish and sweaty (temperature down in the valley today was 32C, I have no idea how warm it was for us) walking, I managed to fall over three times in succession trying to get up the same step, and fell backwards each time. My rucksack was just too heavy for me, and I am not used to anything like that weight – it must have been easily 40lbs or more. 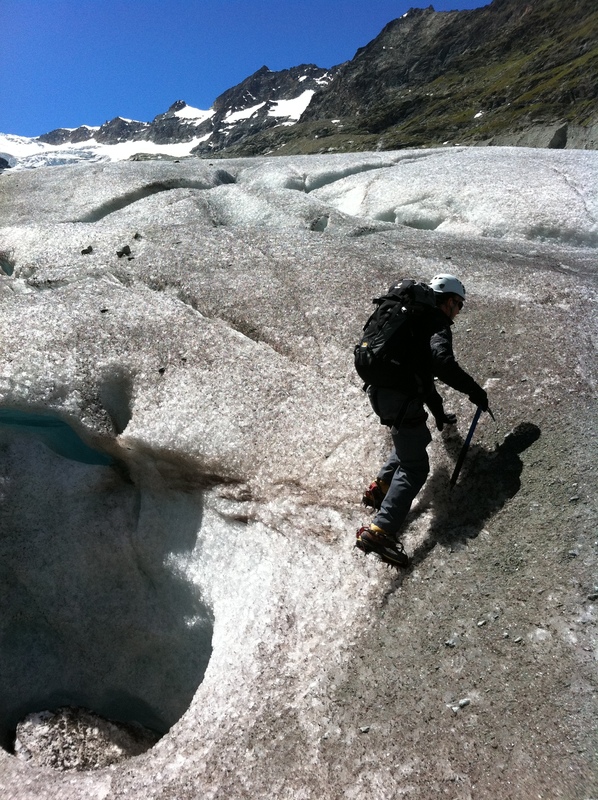 Stepping onto the glacier for the first time, the crevasses are daunting. 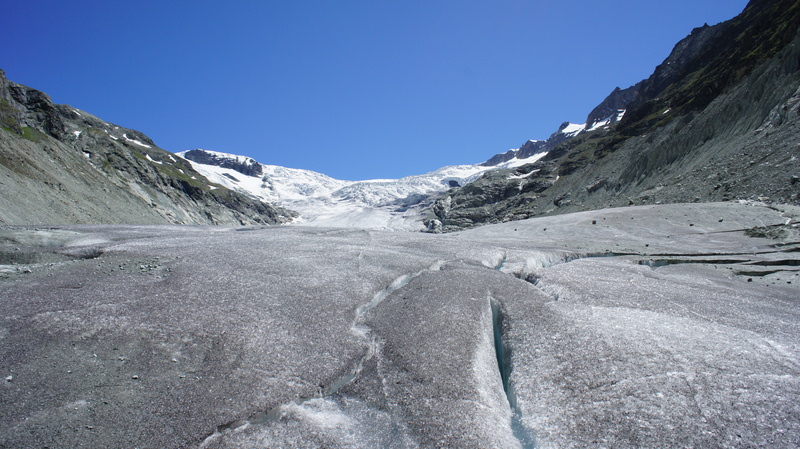 We practiced all sorts of glacier travel, and it was fantastic, I loved it. It is very scary for the first time just hanging from a steep ice wall on a glacier supported by only the two front tips of your crampons and the tip of an ice-axe, but like all things you gain confidence from experience and practice. We travelled a fair way up the glacier, learning about crevasses and how to avoid them, and then roping up for my first time ever. Learning just the knots to tie into was new to me – you use a double-threaded figure of eight, or something like that, if you are at the start or end of the line. We were out for about 7 hours all told, and I loved it. We returned back to the hotel for a well-earned beer at about 5, to find that Kelly, presumed missing from last night, had arrived finally! She had been held up flying from Tenerife via London, and had got to the hotel at about 2pm. It was good to meet her, and we all laughed about the place looking like something out of The Shining again.